PTP Server | TimeMachines Inc. If you need high quality PTP servers (Precision Time Protocol), as well as WiFi and PoE clocks, then you have certainly arrived at the right location! TimeMachines is the business world’s most reliable source for PTP servers (Precision Time Protocol), other types of high quality Time Clock Servers, NTP Wall Clocks, NTP Time Servers with GPS, and more. TimeMachines products are professionally manufactured in North America, and we pride ourselves on giving you and your clients excellent products for very reasonable prices. Whatever precision timekeeping equipment you need to improve your company’s efficiency, we can help. 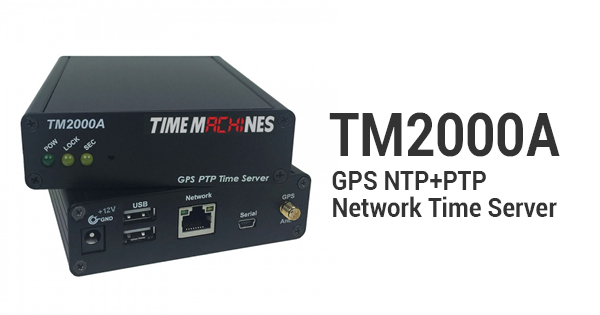 Consider the TM2000A, an NTP+PTP Network Time Server that uses GPS antennae to maintain the correct time as broadcasted by U.S. GPS satellites all over the planet. The TM2000A supports both Precision Time Protocol (PTP) and Network Time Protocol (NTP), meaning your local network can now depend on a Stratum 1 time source with no need for an internet connection. The TimeMachines GPS PTP server represents a major step forward in technological capabilities. Not only will this PTP time server provide the precise time to all devices on your network, but the unit is also small enough to be placed in virtually any area within the network layout. Equipped with a built in high sensitivity GPS receiver, the TM2000A PTP server can lock multiple satellites from within buildings or from a remote location. These servers can be equipped with outdoor antennas and other accessories as well. Additionally, each one of the products manufactured by TimeMachines comes equipped with — at least — a standard warranty of one year. If you wish to have an extended warranty placed on your time server products, however, there are both two- and three-year warranty options available. Keep in mind, however, the extended warranty option is not available on any product involved in international orders. If you are ready to find out more about our high quality NTP and PTP time servers, then contact TimeMachines today. Give us a call at 402-486-0511, or shoot us an email at tmsales@timemachinescorp.com. We look forward to becoming your go-to source for PTP time servers, digital WiFi clocks, and competition score keeping devices.